Average Weight	: 70 - 115 lbs. The Kuvasz originated in Tibet, but developed into the breed it is today in Hungary. Some authors claim that the Kuvasz has been known since the age of the Huns. Others describe it as a sheepdog that accompanied the Turkish refugees and their flocks fleeing the Mongols into Hungary in 1200. Its name in Turkish means "protector." The dog was owned by royalty in the fifteenth century in the court of King Matyas I, who lived from 1458-1490. The King claimed to only trust his Kuvasz dogs and not people. The Kuvasz were often given as royal gifts. At the death of the King, the Kuvasz returned to being a flock guardian throughout the medieval period. They were also used to hunt big game such as wild boar and bear. 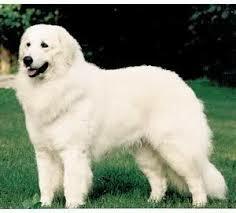 As Hungarian herdsmen traveled with their cattle and dogs, Kuvasz contributed to the development to the Maremma Sheepdog, Great Pyrenees, Polish Tatra Sheepdog and the Anatolian Shepherd, which are all flock guards. One of the world's oldest dog breeds, the Kuvasz was known in Eastern Europe, as early as 2,000 years ago. It is thought this and several other breeds of large European working dogs descended from a single ancestor in the Mesopotamian region and headed west. The Kuvasz has been associated with the Magyar people of Hungary since they were nomadic herds people. The dog was especially valuable because of its ability to herd and guard horses and cattle as well as sheep. The breed received royal attention from 15th century Hungarian rulers who used them for many years as a royal guard. They have also been used to guard the royal children, not infrequently serving as tiny cart horses for toddlers. Today's breed standard is largely unchanged since those times. After being devastated in World War Two, mostly for being fiercely loyal and guarding their charges in the face of mortal danger, the breed was saved by a factory owner who wanted a few Kuvasz dogs to guard his factory from looters. When he had difficulty finding even one, his eventual search found only about 30 dogs left. Today's dogs are descended from those few survivors. By the end of World War ll the breed was almost extinct. A handful of breeders worked to bring the breed back to safe numbers. This ancient and quite intelligent dog was bred to be independent and make decisions on his or her own. As such, the defining characteristics of the Kuvasz personality are the loyalty and protection of the "flock" and a headstrong attitude that borders on the imperious. You will get no respect from this dog for simply being a human. If you want to establish yourself as the alpha dog in this pack, you're going to have to earn that distinction. Most of all, you'll need to behave in a fair and reasonable manner. The Kuvasz is smart enough to know when you're being unreasonable, according to his or her standards anyhow. Punitive punishments will result in a loss of respect and potentially in violence if you really insist upon treating your dog as a slave. While many dogs have an overriding concern to please their owners, Kuvasz and other large herding dogs are more interested in doing the job right. If you're pleased in the process then, all the better. They like to think of themselves as the partner of man and are very happy and successful when treated as such. Commands are not necessarily followed, though not because they don't know what you want. Instead, Kuvaszok want to make up their own minds about any order you give. If it doesn't seem reasonable at the time, he or she will probably ignore you. For this reason, off-leash excursions are not recommended, just in case there's an incident where your dog feels his or her "flock" is in some sort of danger. Because they don't fully develop until they're two, most owners also notice a significant change in their dog's behaviour upon reaching physiological maturity. After two, they "settle down to business" and are able to begin intensive herd training or, even just settle down as companion dogs. If they are to begin herding, they should be introduced to the animals that will be their charges as soon as possible, usually in the first few months. Like all puppies, they will bite and play with the livestock, though it is good to remember that even an 18-month old that weighs over 100 pounds is still a teenager. They will act accordingly. They are typically very good around children and other members of the family, but must be convinced of the good intentions of anyone else. This means that one should constantly have them meet new people (on their territory). While the Kuvasz doesn't normally suffer from much in the way of congenital disorders, being a large dog, there is some incidence of Hip and joint disorders. However, the most common cause of problems among this breed is the result of owners Feeding them as much as they want or with too rich of food. Vitamin or coat supplements are also a major cause of development problems. They were bred to grow up on what could be a starvation Diet if up in the mountains with a flock. This, coupled with the intense amount of growth these dogs achieve in the first six-months of their lives, can cause the bones and connective tissues to develop abnormally. Any owner who sees signs of lameness in their dog, from as early as four months, should bring him or her to the vet immediately to determine if it's simple Growing pains or something far more serious. Growing pains: during the first year, your Kuvasz will grow faster than any human ever has. Because of this, there are often real growth pains, such as those any fast growing teenage boy destined to be tall can describe. Hip displaysia: a good breeder should be able to Show you certificates and X-rays that demonstrate both parents are free from this disorder. The first signs of a serious form could appear as early as 4 months. Bloat: it is recommended that you feed your Kuvasz twice a day to keep them from literally twisting their stomachs when they eat to much at a time. The Kuvasz has a very thick double white coat that is designed to protect him or her from all sorts of weather for literally, months at a time. It is naturally water and dirt repellent as long as you don't wash it very often. However, this breed is known for producing copious amounts of excess hair, especially during the shedding seasons of late spring and early autumn. A doubling of coat care is a good idea during shedding events. Grooming should be done weekly with a "pin comb" or a type of thick comb that looks like tiny horse tack. These are good for the skin as well as removing excess fur, and dogs that are made used to regular grooming from their puppy-hood on will probably enjoy the attention. It is very important that you get your Kuvasz used to grooming when young, because they have the ability to very actively resist you and several friends. Cleaning of the ears and nail care are also very important aspects of grooming. The dog should be made accustomed to regular inspections and grooming at as early an age as possible. This means regularly touching and inspecting the paws and ears. If a Kuvasz gets the idea that you can or should be resisted during grooming, they can easily prevent you. Even if your dog is very active and tends to wear down is or her own claws, pay special attention to the dew claws that can grow right into the paw and cause great pain. Another area of particular concern are the teeth. Because they're large enough to destroy most natural bones, it is difficult to find anything other than small trees that will be sturdy enough to effectively clean your Kuvasz's teeth. As such, you may find yourself giving your dog a bushing with a finger brush and specially formulated poultry flavoured toothpaste. Like many other herding and working dogs, Kuvaszok need to be able to range freely every day. While they don't often take to strenuous exercise and likely won't chase a ball or Frisbee, they do like to have a constant low to mid-level of activity. They are also very serious about keeping busy at work, and the best way to work these dogs is to give them a job. They are large enough to be able to herd and protect even very large herd animals such as horses and cattle, though they will also do well with sheep, alpaca, llama and goats. City dwellers will have a hard time giving a Kuvasz the exercise it needs. A regular walk won't do it unless you can train one to use a treadmill. They are also not good off the leash, so taking them to the park to run around for a few hours is also not a very good option. The exception to this regimen is the first two years of life, when excessive exercise can exacerbate existing tendencies towards skeletal and connective tissue problems. These dogs are very large and can be quite wilful at times. They, like many other herding dogs, are used to making their own decisions and tend to view their humans as either their property or their equals. Socialization training should commence far before any obedience work is done. They tend to take to housebreaking quite easily, as they're naturally rather clean dogs. However, it is important you don't resort to any sort of punitive punishments during the course of your training. They have a very strong sense of "justice," and don't have any respect for someone who betrays their trust. Training should begin very young with reward based play training and socialization. This can slowly be made a bit more strenuous, but should not ever include severe punishments. If you must reprimand, do so immediately. Even waiting a few moments will be out of context for your dog and of less than little use. It is key to remain firm and, above all, consistent with your dog. Don't let other people give him or her commands, as they will usually only accept "guidance" from the alpha. Assuming you've "earned" that role, be sure not to abuse it. If your dog thinks for a moment you're teasing him or her, you will loose respect and may find subsequent commands to be dully ignored.